I’ve zip-lined in a couple of cool places on different vacations (see China, Mauritius), but nothing was as fun as doing it in the Costa Rican rain forest. I was in the country with my family celebrating New Years in 2008. 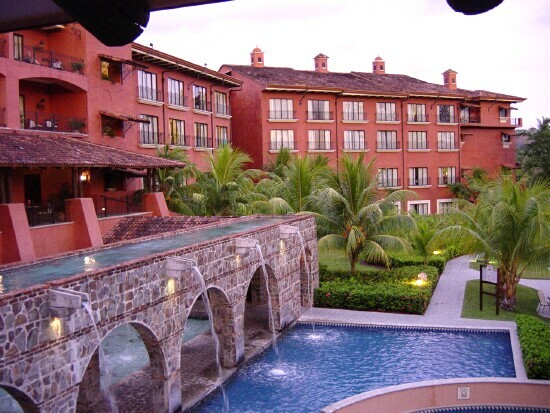 We stayed in a beautiful resort in Jaco, Costa Rica and while we spent most days hanging out by the massive pool and bar, we managed to get out and explore every once in awhile. Zip-lining was our first stop. We made reservations with a local company and drove there bright and early on New Years Eve day. 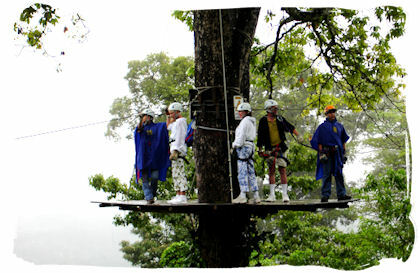 Since the actual zip-lining course was nestled way up high in the hills of the rain forest, our group ( I was traveling with 16 family members) was put in the back of cart that was being pulled by a tractor. Since there was a massive rain storm the night before, the dirt roads leading to the course was washed away, and after about 30 minutes of being towed, the cart almost fell of the side of a cliff and we had to get out and walk the rest of the way. When we finally got up to the first leg of the 14 leg course, we hooked up and zoomed off in to the treeline one by one. The first line ends in the middle of the forest and you find yourself standing on a homemade wooden platform built around a tree. Because my Aunt had an anxiety attack and decided that she did not want to zip line, she had to be hooked to a guide and brought through all the legs (once you get to the top, going through the course is the only way to get down). But they ended up stopping the rest of us, and making the remaining 15 in our group stand on the tiny platform, squeezed together. We all made it through eventually, and ended up on solid ground. The experience was great and I would do it again in a heartbeat.